The progressive escape of reality towards delusion is expressed in the pictures below. 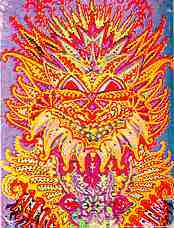 They have been painted by Louis Wain, an European artist in the beginning of this century. Since Wain was young, he used to draw and paint cats for calendars, albums, postcards, etc. When he became 57 years old, he was affected by schizophrenia, which overtook his life as well his art. The last 15 years of his life were spent in psychiatric institutions. His cat's paintings started to change and to show startling images. Quite revealing of his psychotic condition were the cat's eyes. See how they become fixed with hostility, even in the earliest paintings, because the psychotic probably tends to think that the world is looking upon him in a menacing way. Another sign is the fragmentation of the cat's body. They become altered in a strange way under the psychotic's gaze, and almost always are represented as distorted and phantastic shapes. 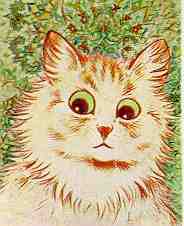 This cat was painted during the first phases of anxiety of Louis Wain, who was later affected with schizophrenia. It differs from previous paintings in the alarmed eye expression and in the . Furthermore, Wain changed his habitual paisagistic background for a more formal and abstract one. In this picture, the cat seems to be in a much more hostile stance, where a devilish tone of red pervades the profile as well as the eyes. This seems to be a projection of the fear that Wain was feeling of being posessed by demos. 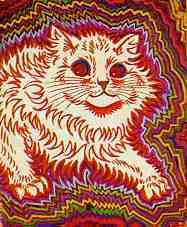 The colored halos around the cat are usually found in paintings by psychotics. In the last stages of schizophrenia, the cats painted by Wain are more abstract, with a total desintegration of reality. Wain has substituted the soft cat forms for simmetric, obsessive, and formal ondes, in a desperate effort to control his mental functions in disarray. Adapted from "The Mind: Time Life Scientific Library", C\copyright 1969 by Time Inc.